I would like to clear up the origins of one of the most beloved stars in Looney Tunes history, Foghorn Leghorn. In late 1944, story man Warren Foster came up with a rooster story for Bob McKimson, recently promoted to a directing position and getting ready to begin his fourth cartoon. This story, eventually titled Walky Talky Hawky, ostensibly starred Henery Hawk, a tough-kid character originally created by Ted Pierce for Chuck Jones’s 1942 release The Squawkin’ Hawk. 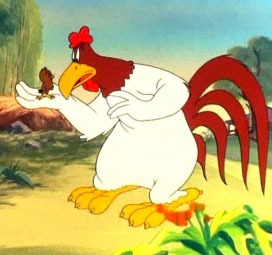 But it was obvious from the storyboard that Foster’s funny rooster would “steal” this cartoon. It is at this early point in the Foghorn saga that even Bob McKimson himself falls victim to the vagaries of recall, because by the time he began being interviewed in the mid-1970s (along with Clampett, Jones and many other Warner veterans), his memory was clouded by both the passage of time and the enormous fame that another old-time radio character, one Senator Claghorn, had enjoyed from 1945-49 on the highly respected comedy program The Fred Allen Show. McKimson recalled telling Foster that he was listening to the radio and had heard Claghorn. He also believed that “Claghorn” had taken his vocal delivery from the old, deaf sheriff on the early variety show, Blue Monday Jamboree. The Jamboree, like much of early West Coast radio, came out of San Francisco, before the show moved to Los Angeles in 1933, when network lines became operational in Los Angeles. At that point most of its cast began Hollywood acting careers, including character man Jack Clifford who originated The Sheriff. Clifford continued appearing as the Sheriff all through the 1930s on local LA programs like Comedy Stars of Hollywood, Komedy Kapers and The Gilmore Circus. He also played bit parts in many films. The Sheriff – who would yell obnoxiously, talk over people, and repeat what he’d just said, prefacing each reiteration with “I say…” – was indeed the inspiration for Foghorn. But it must be emphasized, only for the first cartoon, Walky Talky Hawky. (Actually a major running gag for The Sheriff – bad puns based on mis-hearing what somebody was saying to him – was never a part of Foghorn Leghorn’s character.) But as McKimson mis-remembered it in his later years, he and Foster merged the two characters – the old sheriff and Senator Claghorn – and made them parts of the rooster. Although a major influence on the cartoon, Jack Clifford’s Sheriff was virtually a forgotton local LA radio character by the time the cartoon was released in late August of 1946. But Senator Claghorn, ironically just ten months old, was already a national sensation. Kenny Delmar (1910-84) was a highly successful New York-based radio actor and announcer. He began, like so many others of his era, performing in vaudeville (with his mother and aunt as The Delmar Sisters), before he broke into radio in 1936. An accomplished dialectician, he worked scores of East Coast shows like The Shadow where he met Orson Welles. Welles hired him in 1938 for his famous “War of the Worlds” broadcast, where Delmar, although playing “Secretary of the Interior,” imitated President Roosevelt’s voice and added to the reality feel that Welles was after. In the 1940s Delmar got the job of announcer for the prestigious, intelligent comedian Fred Allen. In his late teens Delmar had hitchhiked cross-country and was given a two-day ride in Texas by a real-life character that every actor dreams about meeting. A bombastic rancher, this man would suddenly turn to his passenger and shout, “Son, I own five hundred head of cattle – five hundred, that is. I say, I own five hundred head of cattle.” He also insisted on finishing his wheezy gags with a hearty “That’s a joke, son! Ah say, that’s a joke!” Delmar stored this voice up in his mental computer and made him a party piece he called “Dynamite Gus.” After doing the voice briefly (as Counsellor Cartonbranch) on The Alan Young Show, a season before Young moved to the Coast in 1946, actress Minerva Pious – a long-time Allen supporting player – suggested Fred try Kenny’s windbag voice for the upcoming radio season. Since 1942, a popular feature of Fred Allen’s radio show was Allen’s Alley wherein the star would wander down a make-believe street and meet a melting pot of Americana (Jewish housewife, a windy Irish-American, a New England farmer and a loudmouth politician). Jack Smart had been playing a pompous politico named Senator Bloat, but Smart had departed the show, and Allen had a hole to fill in his Alley. So when Fred Allen returned to the air for the 1945-46 Fall season beginning October 5, 1945, his large national audience heard the Senator Claghorn voice for the first time. 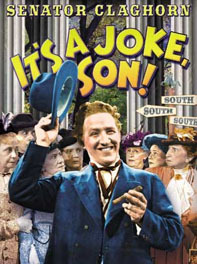 The Senator’s chauvinistic Southern jokes (“I refuse to drink unless it’s in a Dixie cup!”) and catchphrases (“That’s a joke, son” and “That is”), bolstered by the strong comedy scripts written by Allen and his co-writers, became national bywords by the end of his first month, and all across Ameriac entranced listeners began imitating the Senator’s voice. So it was in fact this second entry that McKimson was thinking of when he recalled telling Warren Foster about the Claghorn voice (as he noted, Foster became very excited about the verbal gag possibilities). In Crowing Pains Foggy says, “That’s a joke, boy – ya missed it, went right past you!”And, most importantly showing the marriage of both The Sheriff and Senator Claghorn, “What’s the ga- I say, what’s the gag, son? Gag that is.” This cartoon was the start of Foster’s excellent use of the radio influences for the dialogue in the Foghorn cartoons, dialogue that by the early 1950s entries was often downright hilarious. Meanwhile, following his first season with Fred Allen, Kenny Delmar was wooed to Hollywood to make a feature film starring the highly popular Senator. The movie was called – what else? – It’s a Joke, Son! (it was filmed in mid-1946, while the Allen show was on summer hiatus, and released in early 1947. Interestingly the third Foghorn cartoon’s dialogue was recorded in late July and early August, while Delmar was shooting his movie nearby). Delmar remained with Fred Allen until Allen’s final show in June 1949, at which point the Senator’s fabled radio career ended after four very successful years. (Of course he continued doing the Senator for years in commercials, and even played a similar Southern politician on Broadway in a production of Texas, Li’l Darlin’). And as for Foghorn Leghorn, his character – refined a little more film by film – went on into the 1950s and early 60s in a highly successful series of cartoons. Interestingly, a new supporting hen, Miss Prissy, was also lifted virtually intact from another New York-originated radio character on The Milton Berle Show, that of a dizzy rich woman whose answer to everything was an imperious, vacuous “Yeeeesss” – she was played by Pert Kelton, an early TV foil of Jackie Gleason. I trust this clears up some misconceptions. The legend of Foggy’s origins has been, at best, semi-accurate and clouded in vagueness, but the facts show a different story, and there is simply too much animation studio history that is only semi-accurate or, even worse, totally wrong. Don’t forget that Kenny Delmar used his Senator Claghorn delivery for the voice of “The Hunter”, (Have Nose, Will Hunt) in the KING LEONARDO AND HIS SHORT SUBJECTS cartoon show of 1960 on NBC. Thanks for the reminder, Mark. Those early TOTAL shows had such great New York actors (Jackson Beck, Bradley Bolke, etc.). Thank you, Mr. Scott, for clarifying the mystery of the origins of Foghorn Leghorn’s character! 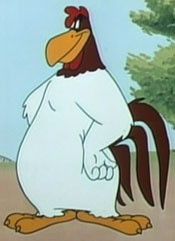 So many people have thought that the idea for Foghorn came entirely from Kenny Delmar’s “Senator Claghorn” character that your precise timeline for the cartoon soundtrack recording dates is essential to solving the mystery! Even Mel Blanc–who didn’t quite remember accurately all the details of his own performing history–always corrected people on that issue. He rightly credited that hard-of-hearing sheriff as being the original concept of the character’s delivery, since, as you note, there was no Claghorn character on radio when the first Foghorn cartoon was recorded. I think that it would be safe to say that aspects of Delmar’s character and delivery were later “borrowed” for the cartoons. I also think that it would be safe to say that the character names Claghorn and Foghorn Leghorn were so similar that it most likely added to the murky origin confusion among fans of both characters! And, if I may be permitted to add a personal note: In about 1953, my parents bought their little boy the Capitol children’s story record called “Henery Hawk’s Chicken Hunt.” My late mother was not an innately funny person, but she enjoyed a good joke. During Henery’s first exchange with Foghorn on that record, the first part of Foghorn’s response just made her laugh and laugh! The part was this: “Now look-a heah, Ah say, Now look-a heah, Boy! Yo’ mouth is flappin’ but nuthin’s comin’ out that makes SENSE!” :-D! Cheers, Walt and congrats on your ongoing research into the recordings of Mel Blanc as well as so much other musical history. Your original 1978 WORLD OF YESTERDAY article on Mel and his recordings was a great early piece. It took that long; almost two years to make those films? (McKimson’s first films as director, including Walky Talky Hawky, were released in 1946; Crowing Pains was 1947, and The Foghorn Leghorn was 1948) I thought they took 9 months. 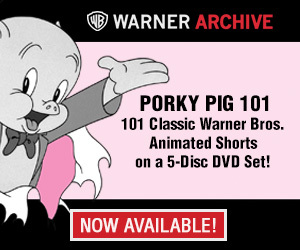 The Warner cartoons were made in about six months, with the music track and final editing done much later. There was also a huge backlog, which is why a cartoon with 1947 copyright might not be released until 1949, and why the studio could close down for six months in 1953 and the full impact (change in personnel, etc.) would not be visible until the tail-end of 1955. Further to Thad’s comments, the actual art side took approx half a year but the entire process began with the gag men, story conferences, then storyboarding, approval, then voice recording, then the labor-intensive six months of art (animation and layouts), followed a little behind by by ink & paint, background paintings, then camera, then music orchestra scoring, any revised dialogue, then final dubbing of music, sound effects and dialogue tracks, then scheduling, publicity art, and finally distribution. We must always consider the art-based almost factory-like industry that produced these works. The release date for WALKY TALKY HAWKY is listed as Aug. 31, 1946 on IMBD. Your research shows the recording session taking place in Jan. of 1945. Was it typical to record the voice tracks more than 18 months before the release date? That seems like a lot of lead time. I bring this up because I’m not completely sold on there being absolutely no Claghorn influence in this first Foghorn Leghorn cartoon. True, the rooster is not named in this cartoon, and I admit that Blanc’s characterization is not as smooth as it would become later. Still, some of the vocal mannerisms and expressions used by Delmar are present, especially the “I say…I say” style of repetition. I’m not discounting the “Blue Monday Jamboree” influence completely though. If some audio of Jack Clifford as “The Sheriff” were to surface I’d love to hear it. Yes, it was very typical, infact standard operating procedure, all the way through the 1940s and 50s for voice tracks to be recorded sometimes 18 months or even longer, before a cartoon was finally dubbed and released. I spent many days at the WB Archives at USC researching this information from various sources, and it’s backed up by many documents. (I have audio of the Sheriff character but I’m a technological primitive I don’t know how to upload…one I’ll learn.) Listen to the first Foghorn cartoon – he’s like a loud cowboy, similar to Yosemite Sam…totally different to the way he eventually sounded. If you have questions about that era, June Foray is still very much alive. She worked with Chuck Jones, Mel Blanc, Fred Allen and many others. June is a treasure, not just because she is family. I have known June since 1971, and yes, she has told me lots of things. But she also admitted that she’d forgotten a ton of stuff I found out about her early career by digging through ancient trade papers, casting journals of the 1940s and bound copies of RADIO LIFE magazine. Many veterans have good recall of certain events but a lot of them have forgotten much that happened, because it was just another day at work decades ago. Incidentally, are you sure June was on FRED ALLEN’s show (it originated from New York)? June did appear on THE HENRY MORGAN SHOW (along with ARNOLD STANG! ), so perhaps that’s the show in question. If we’re playing six levels of Foghorn Leghorn, let’s not forget that Allan “Fred Flinstone” Reed was a player on the Fred Allen show, most notably as Falstaff Openshaw. June appeared on THE HENRY MORGAN SHOW when Morgan came to Los Angeles to make a movie in the fall of 1947. He did ten shows from ABC in Hollywood, and Arnold Stang came with him. While Morgan was on the Coast his sketch players and comic stooges included several people familiar from cartoons (June Foray, Paul Frees, Frank Graham). Stan Freberg also did a novelty guest appearance in one show.. I just realized I should have appended research notes to this piece. Here are my main sources: Robert McKimson interview with Mike Barrier, 1971; Robert McKimson interview with Mark Nardone, 1976 (in THE AMERICAN ANIMATED CARTOON, by Gerald and Danny Peary); Steve Schneider: THAT’S ALL FOLKS (Henry Holt, 1988); Fred Allen: TREADMILL TO OBLIVION (Little, Brown, 1954); Alan Havig: FRED ALLEN’S RADIO COMEDY, Temple University Press, 1990; “Remembering Kenny Delmar” by Anthony Tollin (Movie & Film Collector’s World, August 24, 1984); “Claghorn’s The Name” by Tweed Brown (TUNE IN magazine, Vol 4, No 4, August 1946); music department records, WB Collection, USC; many radio shows, including THE FRED ALLEN SHOW, COMEDY STARS OF HOLLYWOOD, KOMEDY KAPERS) in KS collection; many cartoon audio soundtracks in KS collection. I believe the Kenny Delmar character on the Alan Young show was called Councilman Cottonbranch, rather than Cartonbranch; the name referring to his Southern-fried accent. (I did check Wikipedia and it read “Cartonbranch,” but that may be due to Delmar’s own dialect pronunciation (“CAW-tonbranch.”) According to Greg Bell, host of “When Radio Was,” Fred Allen heard Delmar on Young’s show and asked Young’s permission to allow Delmar to play the same type character on his own show. Young readily agreed and the rest was radio history. In the Total Television book, voice actor Bradley Bolke (Dayton Allen’s brother) claimed Delmar swiped the idea for the character from an unproduced play his brother and Delmar co-wrote; a law suit apparently followed which Delmar won. I have read that Delmar considered both Foghorn Leghorn and Mel Blanc to be “thorns in his side,” understandably so. Bolches, I say, bolches yarboclos pa todos. That is. It’s a joke, son! Keith Scott is a voice actor, impressionist and animation historian. Scott provided the voice for Bullwinkle J. Moose in the 2000 motion picture The Adventures of Rocky and Bullwinkle (for which he had been specially flown to the United States several times) and did the voice of the narrator in George of the Jungle and George of the Jungle 2. An expert on the history of Jay Ward Productions, Keith authored the book The Moose That Roared: The Story of Jay Ward, Bill Scott, a Flying Squirrel, and a Talking Moose (St. Martin’s Press, 2000).